Using database on the cloud provides you with lots of advantages such as better focus on your application, no need of installations and backups, high performance and scalability. Google Cloud SQL supports PostgreSQL (in Beta at the time of writing this article) and MySQL databases. For the purpose of this article we are going to show you a simple example on how to visualize data from MySQL database within a RadGridView control. 1. In order to create a database, you need to first enable the Cloud SQL Administration API and set up the billing for your account through the GCP console. 2. As a next step, you should create a MySQL instance which can hold different MySQL databases. 3. 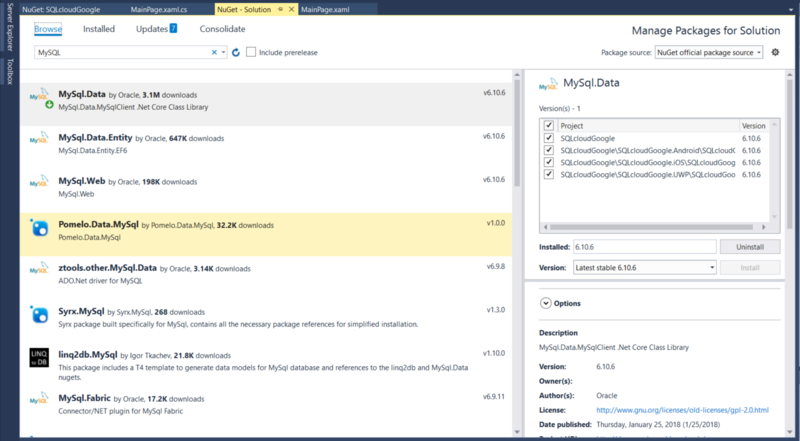 Finally, you can create the database instance as shown in the official Quickstart for Cloud SQL for MySQL. We are going to use this exact database in this example as well. Make sure that you have added several entities so that you are not working with an empty database. Once you have created the database and added different entities within it, you can use some of Telerik UI for UWP's data controls to visualize the data in your .NET application. We are going to use a RadDataGrid. You can create a similar method for closing the connection when needed. Finally, we have to select the data from the database and assign it as an ItemsSource of the RadDataGrid control.